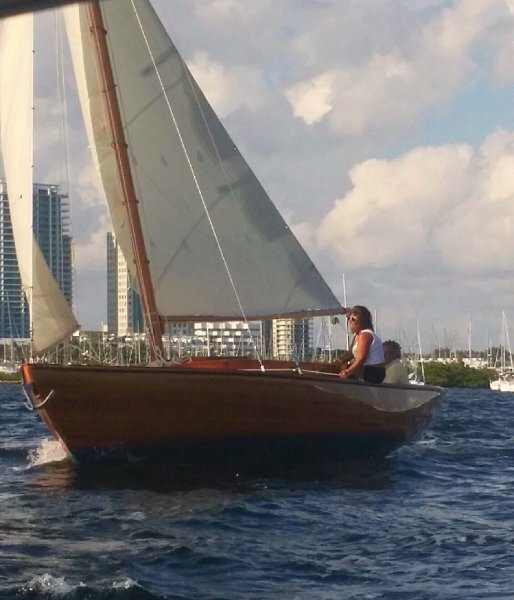 After a couple of years owning and extensively sailing our 12′ Westphal catboat on Biscayne Bay, we decided we needed a larger day sailor. 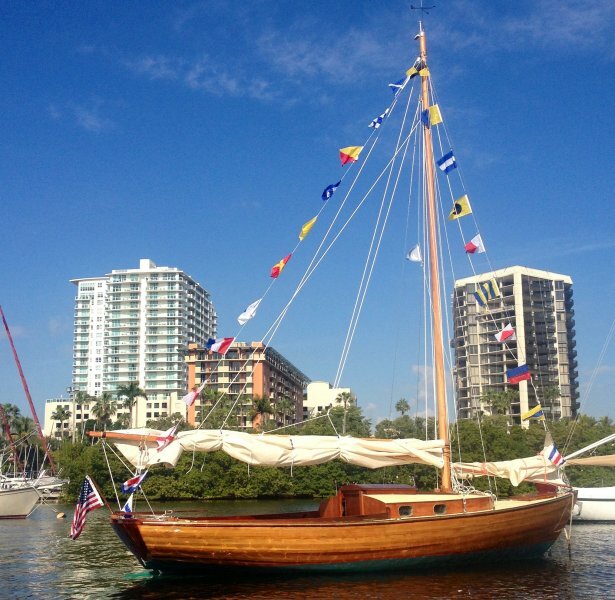 Unfortunately, the classic day sailor market is pretty limited in South Florida and as we couldn’t find anything we liked, the answer obvious: build one. After briefly considering building a Flatfish we figured something around 25′ with a small cabin would be ideal. 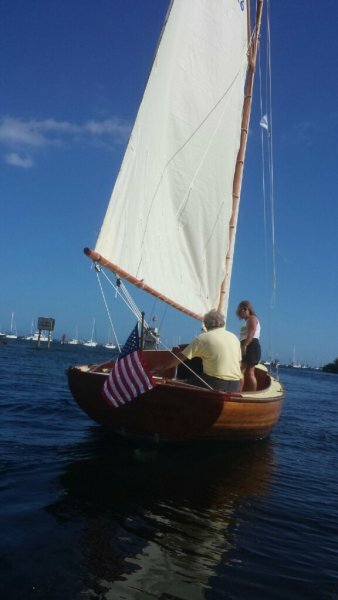 Inspiration for Sabrosura came from a number of trips to New England including a visit to the Herreshoff Museum as well as the construction method and looks of our Westphal catboat. Because we sail year round in warm waters, low maintenance was important; we don’t have the luxury of long winters to work on the boat down here... Strip planking over foam cored glass frames like David Westphal used on the catboat was the obvious choice. Building began in July 2011 by laminating and assembling the frames, keel and deck. Once the structure was done, the hull was strip planked (bead and cove western red cedar) with a single layer of glass outside and three layers inside. 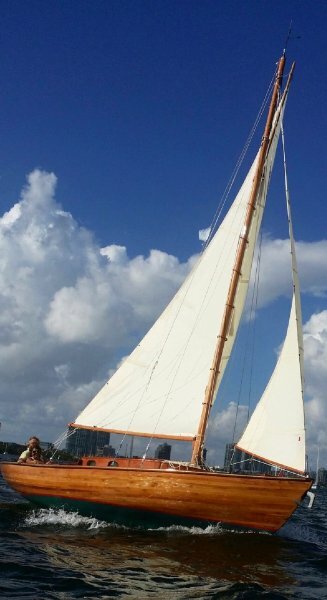 Spars were home build as well, another personal first, using Doug Fir (birdmouth for the mast, solid for the gaff, boom, and jib club. Most of the wood used for the cockpit, hatches, cap rail is Hondurian mahogany; all bronze hardware including the portholes is from Spartan marine in Maine. 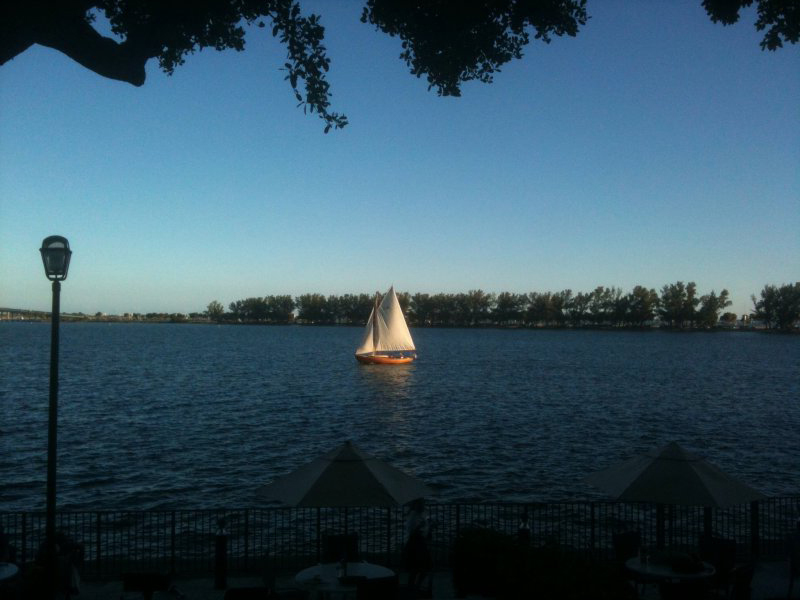 Sails were made by Bremen Sails here in Miami. I consider a large comfortable cockpit to be a critical part of a day sailor and the 8′ cockpit combined with a 9′ beam is what this boat is all about. Head room in the small cabin was sacrificed to keep a low clean profile, yet it is big enough to accommodate a 6′ Vee birth, countertop with sink and a fully enclosed electric head. Other features include a small fold down swim platform, electric inboard, and below deck windlass.